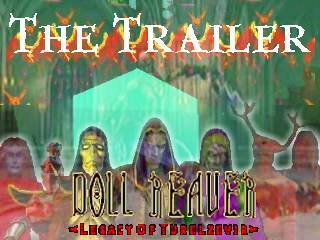 The famous Legacy of Turelzevir: Doll Reaver™ Trailers are now available for download. Witness this uber-game in action and allow yourself to be overwhelmed by the cinematic lovelyness of it all. This first three-minute long trailer gives the watcher a glimpse into the superior gameplay and involving emotive story delivery that defined the games under the franchise's previous name, the Legacy of Kain™. The second shorter trailer proves that Kain's coin had a really sharp edge. Moebius may have been the Dark Forces plaything, but this plaything has just been paid. In true cinematic style, Moebius demonstrates to his fellow guardians the new incredible army bestowed upon him. 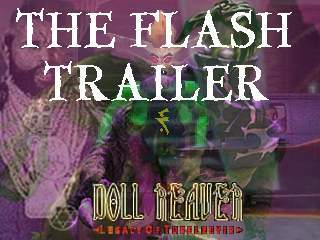 The third is the ludicrously engrossing original Flash trailer, hacked out of the bowels of Crystal Dynamics' most secure supercomputer by Kain Xiorcal over a year ago. 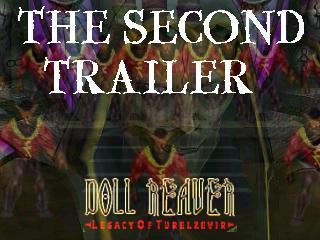 Kain lost a lot of good men to bring us this early demonstration of the game in action, and it is with his written permission that the trailer is hosted at the Legacy of Turelzevir site. Be warned that these trailer do contain spoilers for the game, and some or all elements of the game can still be changed before final release. NOTE - The first two trailers are compressed using the Windows Media 8 codec, some older versions of windows may recquire a short installation of the correct codec from here [microsoft.com - 800kb]. Also, the trailers are zipped for just that little bit of extra compression, decompression software available here for those who don't already have it installed. Mac users will probably need to install Windows Media Player for Mac to run WMV files. Apologies to Linux and other OS users, I need to use Microsoft's Codecs because they are just damn good at compressing. No exclusion is intended. On the subject of compression, yes, I know they are HEAVILY compressed, and this comes across when watching and listening to them, but I've had to squeeze all of this in a very small amount of space. If anyone would wish to donate a larger amount of webserver space, I would gladly upload higher quality and different format trailers, thanks.